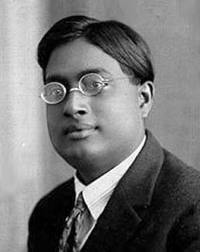 Satyendra Nath Bose Indian scientists, Indian physicist, specializing in mathematical physics. Bose was born in Kolkata. Satyendra Nath Bose (January 1, 1894 - February 4, 1974) was a Bengali Indian physicist, specializing in mathematical physics. Bose was born in Kolkata (Calcutta), the eldest of seven children. His father, Surendranath Bose, worked in the Engineering Department of the East India Railway. He knew many languages and also could play Esraj (a musical instrument similar to violin) very well. Bose attended Hindu High School in Calcutta, and later attended Presidency College, also in Calcutta, earning the highest marks at each institution. From 1916 to 1921 he was a lecturer in the physics department of Calcutta University. In 1921, he joined the physics department of the then recently founded Dacca University (now called University of Dhaka), again as a lecturer. In 1926 he became a professor and was made head of the physics department, and continued teaching at Dacca University until 1945. At that time he returned to Calcutta, and taught at Calcutta University until 1956, when he retired and was made professor emeritus.Although more than one . Nobel Prize was awarded for the discovery of the boson, Bose was not awarded the Nobel Prize for their discovery or for his famous Bose-Einstein statistics. While at the University of Dhaka, Bose wrote a short article called `Planck`s Law and the Hypothesis of Light Quanta`, describing the photoelectric effect and based on a lecture he had given on the ultraviolet catastrophe. During this lecture, in which he had intended to show his students that theory predicted results not in accordance with experimental results, Bose made an embarrassing statistical error which gave a prediction that agreed with observations, a contradiction. Since the coins are distinct, there are two outcomes which produce a head and a tail. The probability of two heads is one-fourth. The error was a simple mistake that would appear obviously wrong to anyone with a basic understanding of statistics, and similar to arguing that flipping two fair coins will produce two heads one-third of the time. However, it produced correct results, and Bose realized it might not be a mistake at all. He for the first time held that the Maxwell-Boltzmann distribution would not be true for microscopic particles where fluctuations due to Heisenberg`s uncertainty principle will be significant. Thus he stressed in the probability of finding particles in the phase space each having volumes and discarding the distinct position and momentum of the particles. Physics journals refused to publish Bose`s paper. Discouraged, he wrote to Albert Einstein, who immediately agreed with him. Bose had earlier translated Einstein`s theory of General Relativity from German to English. It is said that Bose had taken Albert Einstein as his Guru (the mentor). Because photons are indistinguishable from each other, one cannot treat any two photons having equal energy as being different from each other. By analogy, if the coins in the above example behaved like photons and other bosons, the probability of producing two heads would indeed be one-third. Bose`s "error" is now called Bose-Einstein statistics. Einstein adopted the idea and extended it to atoms. From this, the duo predicted the existence of phenomena which became known as Bose-Einstein condensate, a dense collection of bosons (which are particles with integer spin, named after Bose), which was proven to exist by experiment in 1995. Bose`s ideas were afterward well received in the world of physics, and he was granted leave from the University of Dacca to travel to Europe in 1924. He spent a year in Paris and worked with Marie Curie, and met several other well-known scientists. He then spent another year abroad, working with Einstein in Berlin. Upon his return to Dhaka, he was made a professor in 1926. He did not have a doctorate, and so ordinarily he would not be qualified for the post, but Einstein recommended him. His work ranged from X-ray crystallography to grand unified theories. He together with Meghnad Saha published an equation of state for real gases. Apart from physics he did some research in biochemistry and literature (Bengali, English). He made deep studies in chemistry, geology, zoology, anthropology, engineering and other sciences. Being of Bengali origin he devoted a lot of time to promoting Bengali as a teaching language, translating scientific papers into it, and promoting the development of the region. In 1944 Bose was elected General President of the Indian Science Congress. In 1958 he became a Fellow of the Royal Society.